Technology in Dentistry has improved the way we deliver our dental care to our patients. Dentistry is an ever-evolving field and becoming a metal-free office is what we have evolved into. Wholistic-minded dentistry is being aware of how whatever happens in the mouth can affect the rest of your body, and even the other way around. When my mother, Dr. Ibtisam Rashid, first opened her doors in 1998, she had always wanted her dental practice to be the place where patients can feel relaxed, knowing that they have a friend who just wants to help them with their smile. By treating one patient at a time, she had the opportunity to get to connect to our patients on a more personal level and in the process, we become family. Having grown up in the dental office, I knew that dentistry was my calling. I saw patients walking in with pain and walking out with a smile on their face. I loved the stories that our patients would tell and I felt like I had traveled with them on their journeys in life. Once I became a dentist in 2010, I started working with the patients that I grew up with and now, I’m starting to treat their own children! It is such a wonderful feeling when I can see a family go through all life’s experiences and be able to grow with them. One of my favorite things is setting time aside for just catching with my patients about their day or a recent event or vacation they had. For a moment, we step outside of the mouth and enter happy thoughts! We love to have fun, just as a family should, and celebrate with our patients! We pride ourselves with maintaining a standard of excellence that promotes quality dental care customized to treating the whole person rather than just treating the disease process. Hence, we practice Wholistic Dentistry and seek to give you a whole new You! Beautiful Smiles Dentistry is located in the Placer Town and Country Village, near Interstate 80 across from Fry's Electronics. We have been at this location for over 20 years. Our mother-daughter team of Drs. Ibtisam and Hana Rashid provide general dentistry to all ages in a friendly, Eco friendly, Mercury-Free environment. Dr. Ibtisam Rashid has been practicing Dentistry since 1976. She completed her dental education at the University of Baghdad, and completed her Postgraduate training at UCLA. She also completed training with Progressive Orthodontic Dental Seminars. She has served the Sacramento, Roseville, Rocklin, Lincoln, Granite Bay and other surrounding areas for over 22 years. 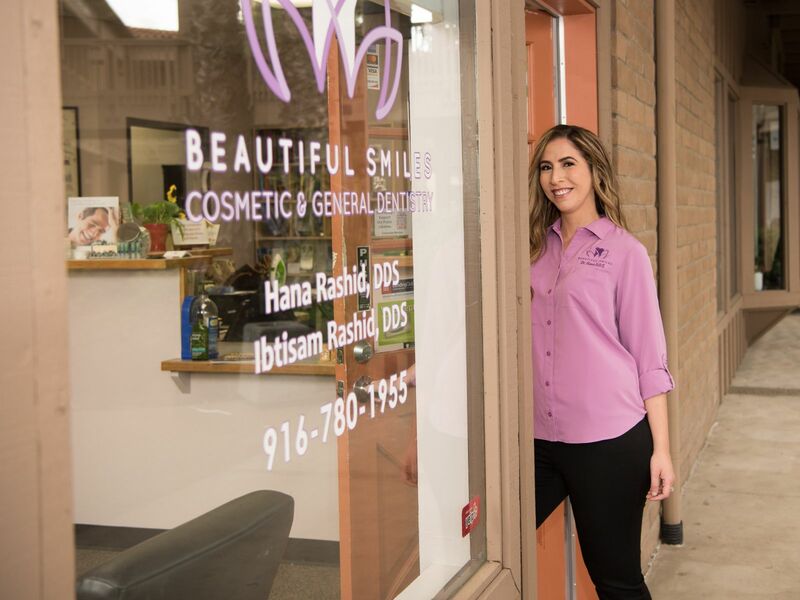 Dr. Hana Rashid started out as a dental assistant for Beautiful Smiles Dentistry prior to attending dental school. She completed her undergraduate studies at UC Davis, with a major in Genetics and a minor in Psychology. A graduate of the University of the Pacific Arthur A. Dugoni School of Dentistry in 2009, she went on to complete a 1 year General Practice Residency in Fresno, CA.